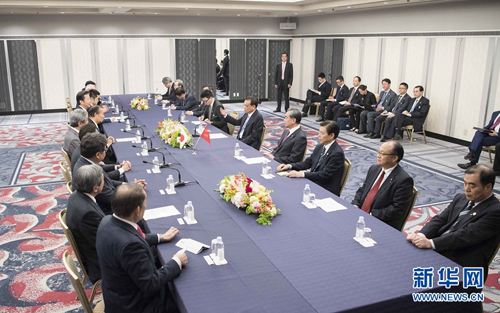 On the afternoon of May 10, 2018 local time, Premier Li Keqiang met at the hotel where he stayed in Tokyo with a delegation of principals of the ruling parties of Japan led by Secretary-General of the Liberal Democratic Party (LDP) Toshihiro Nikai and Leader of New Komeito Party (NKP) Natsuo Yamaguchi. Li Keqiang expressed that this year marks the 40th anniversary of the signing of the China-Japan Treaty of Peace and Friendship. Over the past 40 years, China-Japan relations have both witnessed substantial development and experienced twists and turns. The two sides should, in line with the spirit of the four political documents between China and Japan, firmly grasp the general direction of peace, friendship and cooperation, and propel cooperation in various areas, so as to promote steady and long-term development of bilateral relations. China is willing to make concerted efforts with the LDP and the NKP to create a new future for China-Japan relations after all the hard times. Principals of the ruling parties of Japan expressed that coinciding with the 40th anniversary of the signing of the Japan-China Treaty of Peace and Friendship, Premier Li Keqiang's visit has brought bilateral relations back to normal track. The Japanese side highly appreciates it. As ruling parties, the LDP and NKP stand ready to enhance party-to-party exchanges with the Chinese side to continuously make unremitting efforts in pushing Japan-China relations for greater development.